It’s pretty fair to say the popular choice this year has been rose gold detailing in your homes, jewellery and embellishing your wedding. Glam up your wedding with lots of rose gold decorative detail – it goes with all colour schemes and makes everything so much more sophisticated. 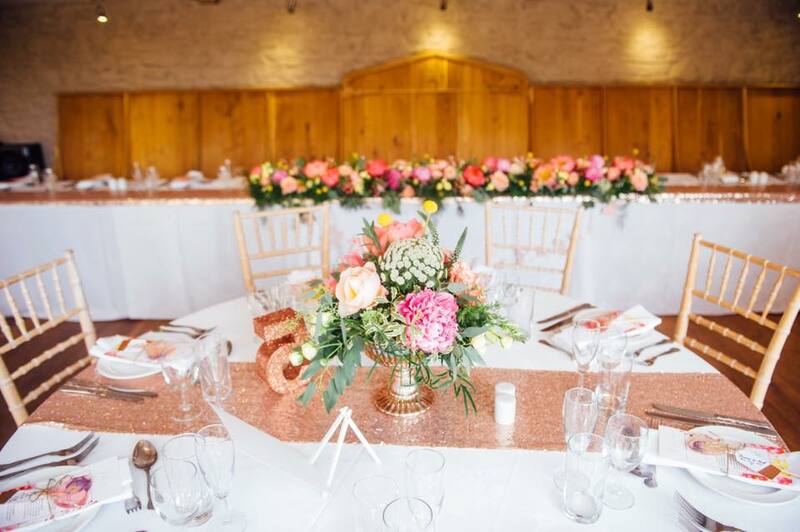 A favourite wedding of ours this year was pinky corals with peach tones complimented by rose gold accents. We had rose gold footed bowls which are also available to hire. We had sequin rose gold table runners and glittery table numbers that were created by the bride herself by mixing three colours of glitter just to get the perfect shade! Instead of traditional gold or silver, accent your tables with rose gold details. It offers a fresh take on the metallic trend and looks gorgeous at nearly any type of event, from rustic chic barn weddings to formal estate room receptions.